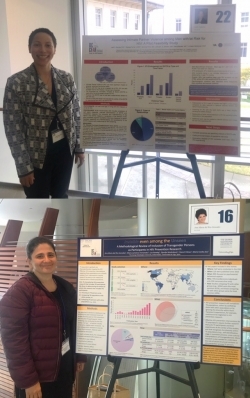 DC CFAR investigators Leah Squires, PhD from the Veterans Affairs Medical Center and Ana Maria del Rio-Gonzalez, PhD, from George Washington University presented posters during the Scientific Symposium at last week's National Center for AIDS Research Meeting at Emory University. Dr. Squires' poster featured results from her DC CFAR pilot award and was entitled, "Assessing Intimate Partner Violence among Men with/at Risk for HIV: A Pilot Feasibility Study". Dr. del Rio-Gonzalez's poster focused on results from her CFAR Adelante-funded project and was entitled, "Invisible even among the Unseen: A Methodological Review of Inclusion of Transgender Persons as Participants in HIV Prevention Research". Both Drs. Squires and del Rio-Gonzalez also participated in the Early Stage Investigator Mentoring Workshop, where session topics included the NIH review process and developing a responsive research proposal. Congratulations, Dr. Squires and Dr. del Rio-Gonzalez!